Another fleet of new trucks is on the road to serve with the Canadian Army. 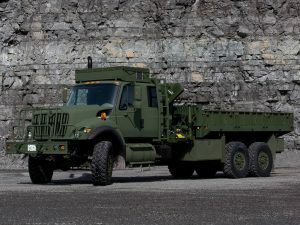 The new Standard Military Pattern (SMP) truck is a four axle, 9.5 tonne capacity vehicle, intended mostly for use with the Regular Force. Two percent of the fleet, this variant is also similar to the MHC. It is configured with the cabling necessary to attach an artillery computer when the M777 is under tow.